Home » Demokrasi » Leader of Islamic Schools (Indonesia) Prediction Trump Wins US Presidential Election! 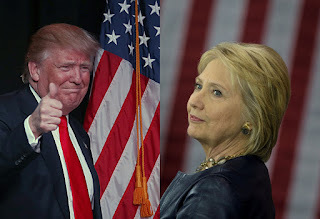 Leader of Islamic Schools (Indonesia) Prediction Trump Wins US Presidential Election! JurnalMalang.Com - Election of the President of the United States to the attention of the world community, including the people of Indonesia. Who will be elected President of the United States (POTUS) will certainly affect the national political constellation and Indonesia's foreign relations. For the people of Indonesia, between Hillary Clinton and Donald Trump has a significant difference. Clinton is part of Obama are partly responsible for conflict in Muslim countries is prolonged. While Trump rational figure who showed no signs of a wicked politician. KH. Thoriq Bin Ziyad, charismatic Muslim leader from East Java, the initiator of the National Muslim Student Day (Hari Santri Nasional, HSN Indonesia), estimates that people's democratic party of the US, which was held on November 8, 2016 will be won by Donald Trump. Trump is the candidate of the Republican Party's most widely discussed in the country's largest Muslim population in the world. "Donald Trump ... the President." He wrote via his social media account (10.05.2016). Thoriq not explain why a candidate Trump. He explained that historically the USA never choose a woman to be president. Many of analysis developed in social media that Donald Trump is a figure that is relatively inflexible with the Muslim world. When he became President of the United States then there is hope Middle-East Countries conflict ended and the US military will be withdrawn from the conflict areas. Many Indonesian political observers believe the figure Donald Trump is able to reduce potential conflicts of Islam - the West touted as heralding Samuel Hungtington the provocative thesis of the Clash of Civilizations. In 2015 the Indonesian government has formally establish the National Muslim Student Day is celebrated annually on 22 October. It begins from the proposed KH. Thoriq Bin Jiyad who responded well by President Jokowi. Agreement between Thoriq with Jokowi related HSN done before the Presidential Election (2014) in Islamic Borading School (Pesantren) Babussalam (Malang, East Java) led Thoriq. Furthermore, Thoriq Bin Ziyad is planning a declaration of the International Muslim Students Day which is observed on each of the Islamic New Year 1 Muharram. The idea of ​​this will be easily realized if the support of many world leaders, both Muslim-majority countries and Muslim minority countries such as the USA and Europe. If the correct analysis of the observer that Donald Trump can synergize with the Islamic world, the idea of ​​the International Muslim Students Day will be easily realized widely for the purpose of international solidarity of Muslim students to world peace. (Red1). (The original of Indonesian, translated into English for the help of Google Translate).